Reviews of the doc, here, here, and here. TV Guide has posted their list of the Top Cult TV Shows of all time. BSG is number 14 of 30, and there is a blog page for anyone wishing to leave feedback on the list. OT Hiatus topics of the day: speaking of Farscape, yesterday a friend turned me on to Matt Zoller Seitz's blog, where I found this fantastic overview piece (not written by Seitz). I'm planning a DVD mainlining of this show some time over hiatus. Does anyone want to loan me S1 discs 4-10, as Netflix has it listed on their AVAILABLE: UNKNOWN list since last year? Sigh. TV Guide reports rumors that 24 season 7 may feature a female POTUS. Cool. BSG co-exec producer Mark Verheiden has announced his schedule for the San Diego Comic Con. Also Mark has been working on the film "My Name is Bruce" for Bruce Campbell. Esquire Magazine has a new interview with Katee Sackhoff in which she chats about her kickbutt pilot and evil bionic double duty, her fandom, and her luddite nature. Off Topic of the day (hey, this a long hiatus people! ): Joss Whedon, The Man, The Legend, is up for auction. 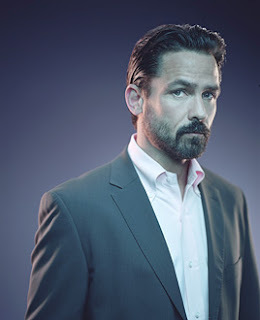 Sci-Fi Wire has more details on the report that The 4400 star Billy Campbell wants to guest on Battlestar Galactica, and will work for free. The TV Addict blog attended the online press event in Vancouver, and reports some spoilers for season 4. Jamie Bamber talks to SciFi Wire about shooting the final season of BSG. Entertainment Weekly has posted a much longer version of the Hogan/Sackhoff interview printed in their "Hot 100" issue. The Guardian has a piece about “The New Sci Fi” and the new recognition of sci-fi/fantasy TV as a place to explore Big Issues in both the USA and UK. This article has single-handedly convinced me to catch up with Dr. Who. Meanwhile, Lost in Austen? Oh I am SO THERE. BBC America, are you listening? SciFi held a BSG pressday on the set in Vancouver yesterday for online journalists and bloggers. TV Addice has posted video of the press Q&A session with Jamie Bamber, Aaron Douglas, Grace Park, Tahmoh Penikett, and...yes folks, that is indeed Michael Hogan. Part 1, Part 2. Warning: Douglas drops some S4 spoilers. I haven’t watched it yet, but apparently Robin Williams' favorite TV show is BSG, according to Douglas. Nanoo nanoo. NBC has posted a new 9-minute Bionic Woman promo which features a lot more Katee Sackhoff (it's the first clip at the top of the Video list; Katee's scenes are in the final 3 minutes). Ohhhhh the pure, simple pleasure of a nasty bionic grrlfight in the rain. Heh. TelevisionWeek's Blink Blog is reporting that the DVD release of RAZOR may be longer than the televised version by 15 minutes or more, pending final cut. Actress Tricia Helfer sits with Talking Pictures host Tony Toscano and discusses her role as Number 6 on the hit series Battlestar Galactica. Edward James Olmos ("Gaff" in Blade Runner) has often said that in 1982 Blade Runner opened a door, and no one went through that door again until Battlestar Galactica came along in 2003. This fall director Ridley Scott will unveil his Final Cut of his SF masterpiece. Speaking of trailers, I uploaded an iPod ready version of Sci-Fi channel's promo for the promo of "Razor" referenced in a post below by ProgGrrl. So, just check your iTunes podcast downloads if you already subscribe, or grab the video via iTunes. You know one of the amazing things about Battlestar Galactica? There is no one character who always manages to do the right thing. There are characters who try, but they don't always succeed. And the right path isn't always obvious, and outcomes are unpredictable. Even the bad guy is really only disastrously selfish, not evil. Even the robots are human. This gives the writers lots of opportunities to write the very best kind of fights. The kind where both sides are right. And Battlestar Galactica fan Wil Wheaton delivered a great and moving speech to induct Gene Roddenberry into the Science Fiction Hall of Fame in Seattle, Washington. Definition of pop dope: It's what you gotta have...These are the Quarter Pounders of the soul we're talking about, Big Macs of the mind, cheese fries of the imagination...And sometimes you get the good stuff. Take Battlestar Galactica. Excellent pop dope! 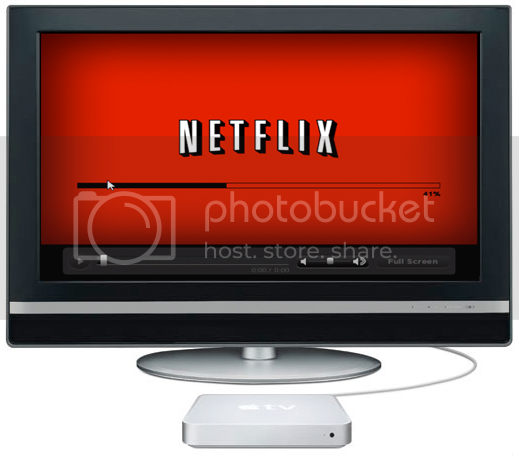 I've been downloading season 3 from iTunes at a faster and faster clip, sending them over to my TV by way of some agreeable Macintosh juju, and then pigging out...Pop dope, baby. It gets into your brain and just simmers. SciFi aired this promo last night for a "sneak peak" of Razor to air during the Eureka season premiere on July 10th. Screencaps of each character have been posted here. CanMag has a rehash of information Ron Moore has said about the Pegasus movie, "Razor". Voting for The Golden Toaster Awards is now open. Tricia Helfer will be be attending the Wizard World Chicago convention the weekend of August 9-12. The world needs more Romo. 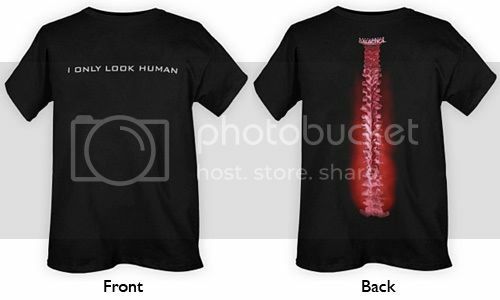 starsprinkles has spied a couple of BSG related tees on the Hot Topic website this week, and posted them on the Battlestar Blog. TrekGirl42 has created a credit sequence for BSG using the Angel theme. Well, Joss Whedon is a fan of Battlestar Galactica after all. As you may have noticed we've made some visual changes to the Galactica Sitrep. ProgGrrl and I plan to add other touches and features along the way as well. And comments should now work properly. Athena and Helo have made AOL TV's lists of Hottest TV Moms (#2) and TV Dads (#15). IGN has posted an interview with Katee Sackhoff in which she discusses both BSG and Bionic Woman. E! 's Kristin has a few news items and spoilers in this report about Battlestar Galactica: Razor, as well as some information about Katee Sackhoff in Bionic Woman. The information is about midway down in the story. 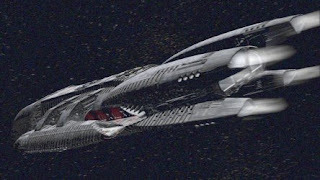 SyFy Portal reports on some insider news from sources within the production of BSG, and confirms a few of the rumors about aspects of the story of the telefilm/dvd Battlestar Galactica: Razor. The article contains some spoilers. CraveOnline has interviews with Ronald D. Moore, Edward James Olmos, Katee Sackhoff and Grace Park. Leah Cairns spoke to the Shaun OMac Radio Show for almost an hour on June 15, about BSG and her work on Kyle XY (her first episode airs tonight in the US), and the new webisode series Sanctuary. Apparently 13 million people logged on for the premiere ep of Sanctuary, which is good news! UGO.COM's, Jenelle Riley reports about the Q&A session at the Cinerama Dome. Creation Entertainment has announced that Jamie Bamber and Katee Sackhoff will be guests at their cons in Chicago (Oct. 5-7) and Sacramento (Sept. 28-30) this year. Both cons are also having fanvid contests. brokenmnemonic has pulled up interviews from The SciFi World that I hadn't seen before, with Michael Rymer, Rekha Sharma (Tory), Mark Sheppard (Romo), Grace Park (Sharon), and Leah Cairns (Racetrack). Some people have too much time on their hands. Seriously though, that is adorable. TV Squad wonders if Glen Larson will ever allow a motion picture to be made based on the new re-imagined Battlestar Galactica. 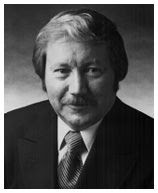 Larson, as creator of the original Battlestar retains all the film rights to Galactica. Supposedly this is why the upcoming telefilm "Razor" has to air on TV first before coming out on DVD even though releasing it direct to DVD had been the original plan. G4 has posted video highlights from the discussion panel moderated by Lucy Lawless from inside the BSG Cinerama Dome event. If you weren't there, this is about as close as we can get. I should probably mention that comments don't seem to be working again. I'll fix the problem soon. Until then just sent question and comments to logan[dot]gawain[at]gmail[dot]com until the problem is rectified. ...Hi...is this thing on? OK, good. The Official Battlestar Galactica Convention this fall is confirming guests Jamie Bamber, Katee Sackhoff, Tahmoh Penikett, and Kate Vernon. They are also running a fanvid contest (submissions due by November 1st). Kristin at E!Online has posted a second video of her red carpet interviews at The Dome last week. (I think Bamber may be trying to kill us, fellow Shippers. Though he gets points for using the word "hot.") For anyone seeking Kristin's I *HEART* APOLLO tee or the FRAK OFF sticker, look no further. Kristin also posted the rest of her "True, False or Frak-No-I'm-Not-Telling-You" game with Ron Moore. Hey, every tidbit helps when you're on Helliatus. AfterEllen.com places Katee Sackhoff at number 84 on their Hot 100 List. Umm, 84? Really? Katee, you ought to do something about that. The Galactica Sitrep is proud to announce the addition of a valued contributor to these pages. ProgGrrl who has written extensively about Battlestar Galactica for the BSG message boards on Sci-Fi.com and on her own LiveJournal has joined the Sitrep. Mary McDonnell spoke to The Envelope (The Awards Insider from the L.A. Times) about Battlestar Galactica and the prospects of Emmy nominations. TV Guide reports from the cast event at the Dome. Slice of Sci-FI has a detailed rundown of the red carpet arrival interviews from the Cinerama Dome. Kristen Veitch of E! has posed video of her adventure at the Cinerama Dome event. She talked to Ron Moore, Katee Sackhoff, Edward James Olmos, and had a close encounter with Jamie Bamber. 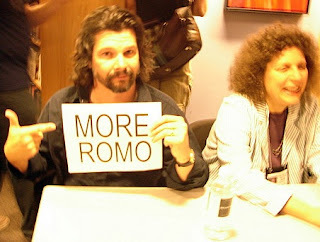 Ronald D. Moore updated his blog and comments on his reaction to the Soprano's series finale. Does Ron wish he could end BSG in a similar fashion? SyFy Portal reports on speculation that we might see original Lorne Green era Galactica series type toasters in the BSG DVD/telefiilm "Razor". It's been rumored that part of "Razor" involves a flashback to a young Adama during the first Cylon war. TV Squad has a posted part 2 of their report from the BSG Cinerama Dome event from last week. Meevee.com talked to Ron Moore at the Dome. And Collider.com has video interviews from the Dome event, of Ron Moore, Mary McDonnell and Jamie Bamber, and Lucy Lawless and Katee Sackhoff. Trek Movie Report gets Ron Moore's take on J.J. Abrams directing Star Trek. Writer Clark Perry provides an in-depth report from the BSG Cinerama Dome festivities on his blog. BSG co-exec producer Mark Verheiden briefly reflects on the Dome event and thanks the fans for always supporting the show and expresses his hope for more BSG events of this type. Sci-Fi Pulse has video of Katee Sackhoff and others at the Saturn Awards. David Eick told Sci-Fi Wire he hopes to use as many BSG actors as he can in the new Bionic Woman. ABC will finally air episodes of Masters of Science Fiction in a four-week run starting Aug. 4, Zap2it.com reported. From the same producers as Showtime's Masters of Horror, the anthology series was initially considered a mid-season show; ABC ordered six episodes, but now plans to air only four in the death timeslot, Saturdays at 10 p.m. ET/PT. There's no word yet on which four installments will air. The hourlong shows feature adaptations of stories by such SF masters as Robert A. Heinlein and Harlan Ellison, as well as Walter Mosley. Actors taking part include Terry O'Quinn (ABC's Lost), John Hurt (V for Vendetta), Anne Heche, Judy Davis, Sam Waterston and Malcolm McDowell (NBC's Heroes), the site reported. Moriarty & Hercules report for Ain't It Cool News on the BSG Dome special event. IESB now has video interviews posted from the arrivals at the Dome with Ron Moore, David Eick, Jamie Bamber, Mary McDonnell, Katee Sackoff and Lucy Lawless. Edward James Olmos led the crowd waiting to get into the Dome in a chant of "So say we all." See a bit of it here: (YouTube link). TV Squad adds to the coverage of the BSG Cinerama Dome Event. Read about and see pictures from the Battlestar Galactica All Access event held at the Arclight Cinerama Dome in Hollywood, California. Minor spoilers from the brief trailer of the BSG two hour telefilm "Razor". Full reporting of the Dome events as they happened. The CG Society of Digital Artists has an article about Atmosphere, BSG's effects house and their work on Babylon 5: The Lost Tales. Kindreds a Helo/Sharon fan site, has an awesome interview with Tahmoh Penikett where he talks about his role as Helo and his thoughts on entering BSG's final season. BSG co-exec producer Mark Verheiden reports that he and almost all the other BSG writers will be attending the special event at the Arclight. 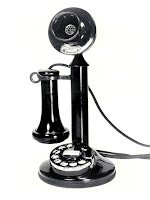 Sci-Fi Wire has a bit about the Eick/Moore telephonic press conference from last week. Sam Witwer, "Crashdown" has a new gig in the realm of Star Wars. Maureen Ryan of the Chicago Tribune's "Watcher" blog has posted a full report and transcript of Ron Moore and David Eick's interesting and entertaining media conference call held last week to discuss Battlestar Galactica's epic conclusion in season 4. SyFy Portal has some updates here and here about the culmination of season 4. What to do over the summer with no new installments of Battlestar Galactica or Lost to view? Check out the B5: The Lost Tales MySpace page. Also on YouTube I found some really moving tributes to two late B5 actors who departed far too soon, Andreas Katsulas who portrayed G'Kar and Richard Biggs who portrayed Dr. Stephen Franklin. Maureen Ryan of the Chicago Tribune has more on the end of Battlestar Galactica, as does The Hollywood Reporter, and Sci-Fi Wire. And here are highlights from the Moore/Eick conference call with the press, as reported by TV Squad and Buddy TV.